On NW First Avenue, between Couch and Davis near the old Import Plaza Building sits a shin level mystery. It is too low to work as a bench, too high to be part of the planter that borders it. 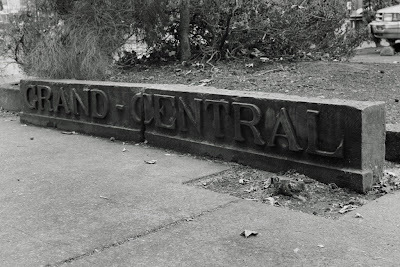 The inscription: GRAND-CENTRAL, suggests a railroad station. This in a way is correct. 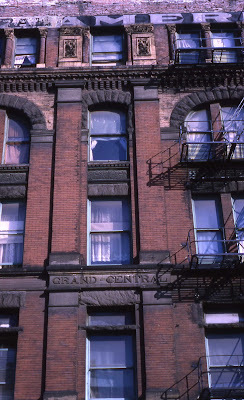 The New Grand Central was a hotel that once towered over Third and Flanders, near Union Station. 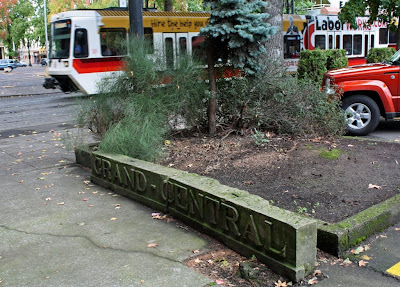 The sandstone piece is one of a surprising number of Portland relics hidden in plain sight. Click on pictures to expand. 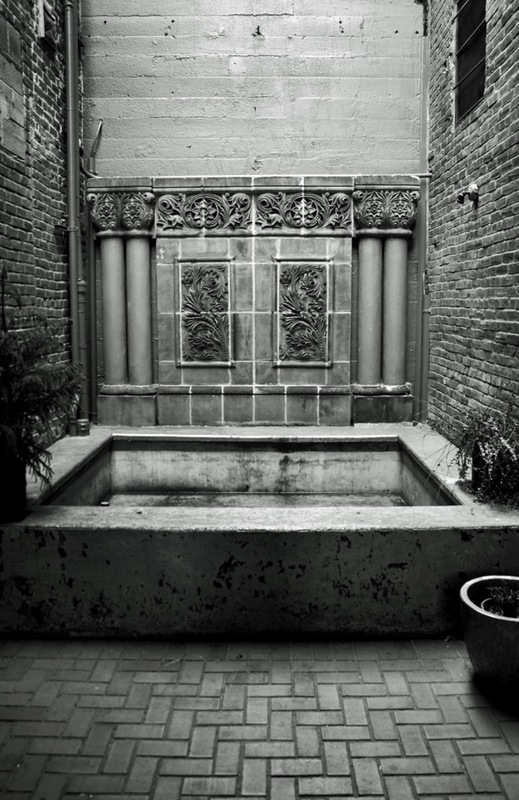 Photo courtesy of the Architectural Heritage Center. 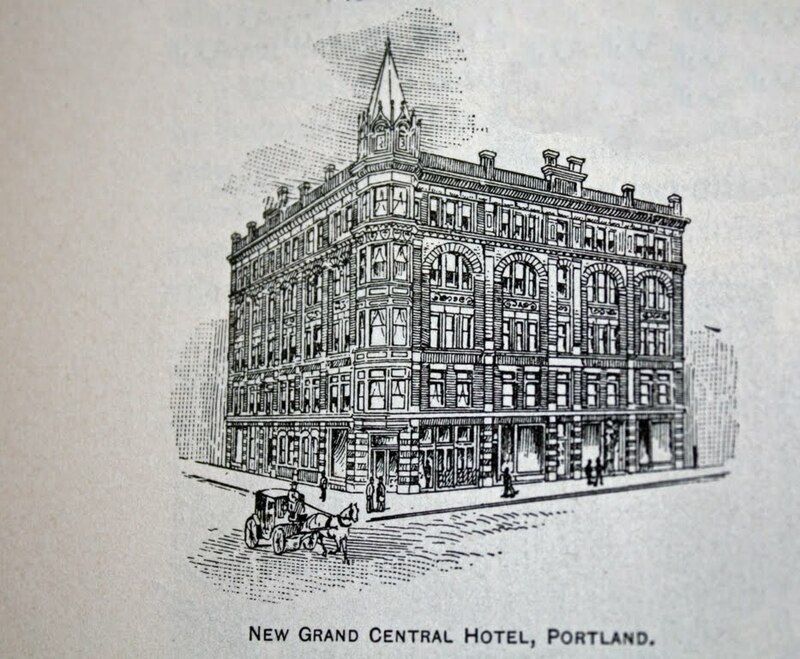 When completed in 1892 by beer mogul Henry Weinhard, the New Grand Central Hotel, on the corner of 3rd and F street, was ideally situated for arrivals from Portland's still under construction Grand Central Passenger Station (Union Station was more a descriptive term than a proper name at the time) and the steamship docks on the Willamette River. The area was a gateway to Portland for travelers, where City and Suburban Railway streetcars descended from the original Steel Bridge into the evolving hotel district to continue downtown on Third Street. 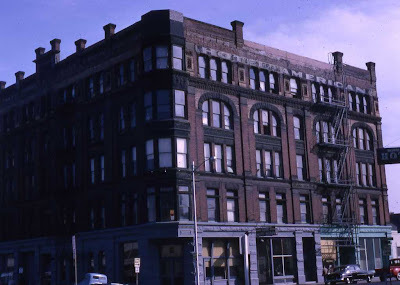 The five story building was designed by architect Henry Hefty (see Peripheral Explorations) in the prevailing Romanesque revival style. It featured a decorative tower and all the modern accouterments of the day. 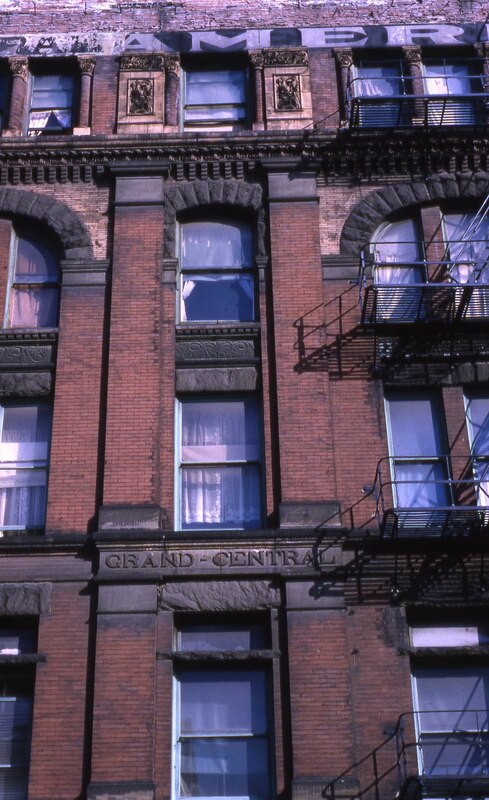 "The New Grand Central contains 142 handsomely furnished rooms, a well furnished office, an attractive dinning room, bar and barber shop, electric lights and elevator. Artesian water and steam heat are supplied throughout the house." -The Oregonian's Handbook of the Pacific Northwest, published in 1894. Looking east on Flanders, towards the new Steel Bridge, post-1915 with an arch from "The Great Light Way" over the intersection at Third. The Royal Palm Hotel in the foreground still exists. 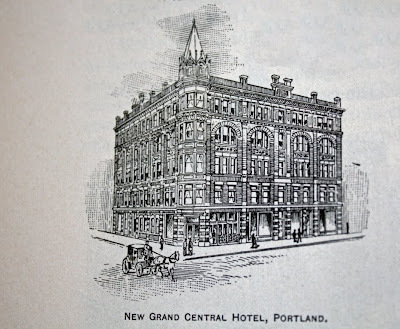 Nearly a quarter century later, by 1915, Portland's luxury hotels were concentrated downtown, while hotels near Union Station, such as the New Grand Central, Hoyt, Royal Palm, Del-Mae-Joe and the Golden West (the only hotel in Portland open to African Americans) catered to travelers of more modest means. 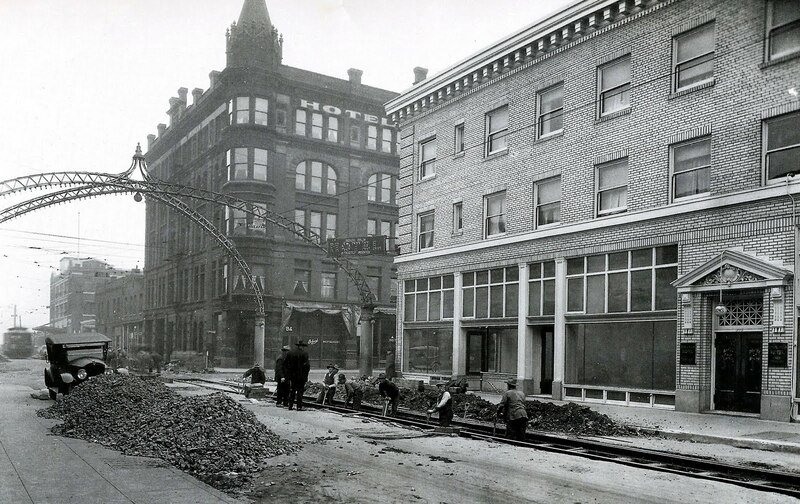 Downtown was moving west, away from its 1890s center on Third Street. 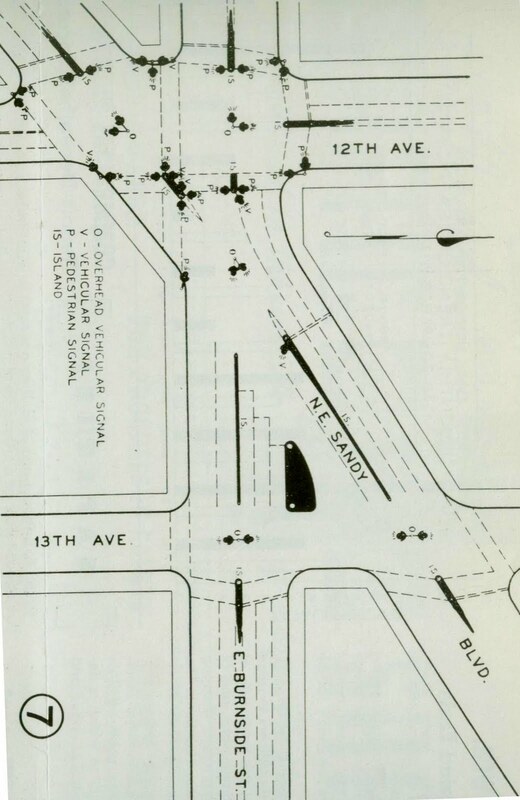 In response, the street's merchants banded together to create "The Great Light Way" of lit arches on Third from Glisan to Yamhill, to provide an attraction to arrest downtown's drift. 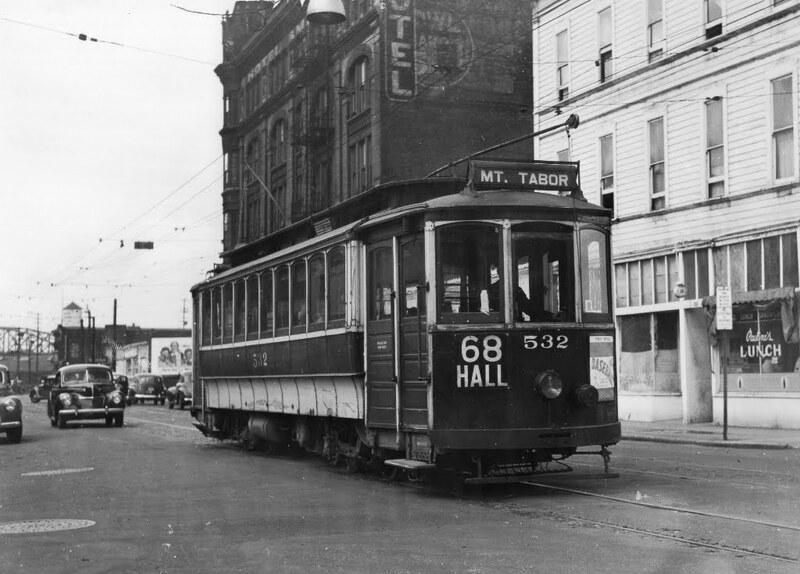 North of Burnside, Portland's Japantown, or Nihonmachi, had coalesced between NW Second and Fifth streets. Japanese American businessman T. Yuasa leased the New Grand Central from the Weinhard estate, renovated it and renamed it the American Hotel. Hotel operation was an attractive business for Japanese immigrants as it provided both a livelihood and a place for their families 30 Japanese American hostelries north of Burnside. "Building leased for a term of years by T. Yuasa: Since the installation of the arches at the intersection of the streets on Third Street, a rejuvenation of this thoroughfare is indicated by the lease of the five story building. 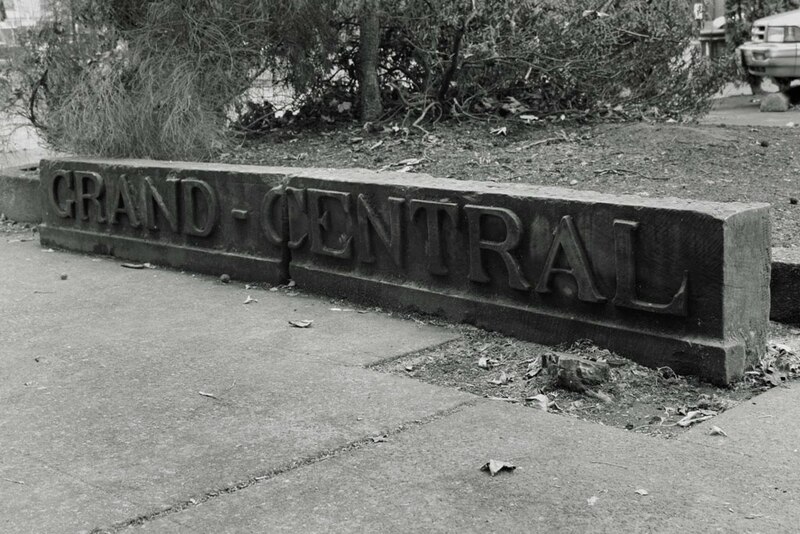 ...It has heretofore been known as the New Grand Central Hotel. The building was constructed in 1892 and is one of the landmarks of that section of Portland. It is held that this marks the beginning of a new era for this particular section of Third." -The Oregonian, June 1915. Japanese born immigrants (Issei) were barred from owning real estate. To operate a hotel, they either had to purchase it in the name of one of the U.S. born children, or lease, as T. Yuasa did. Although the opening of Yuasa's establishment was written up by the Oregonian as evidence of revitalization along "The Great Light Way," the public face of the hotel was that of clerk W.H. 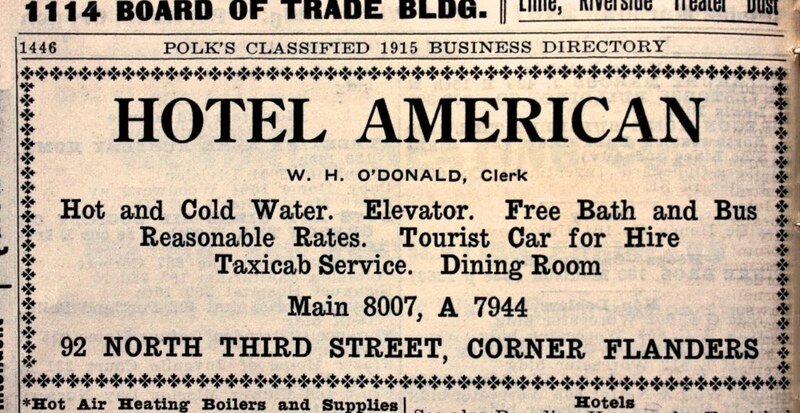 O'Donald in this advertisement from the Portland City Directory of 1915. A 1948 view looking north on Third with a flood detoured Mt. 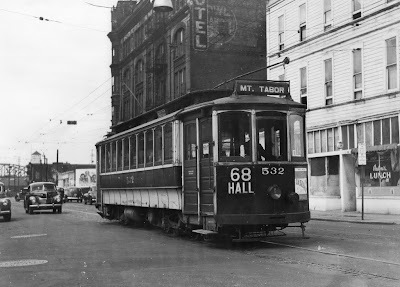 Tabor streetcar and the American Hotel. 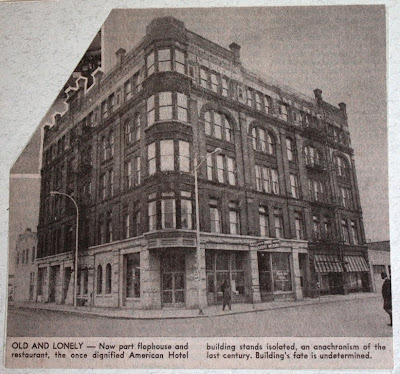 The wooden building is shown in the 1889 Sanborn Insurance atlas as the St. Lawrence Hotel. Photo courtesy of Sheldon Perry. 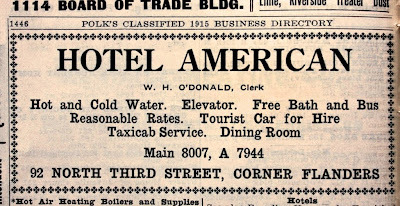 The American Hotel's proprietors changed frequently throughout the 1920, before settling on Joseph Grimm, who operated it from 1935 to 1950. 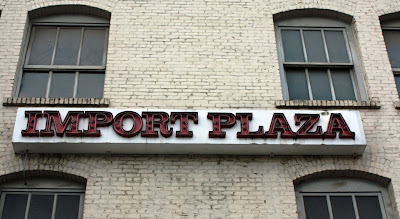 During World War II, the neighboring Royal Palm Hotel was opened to African American shipyard workers as wartime housing. It is not known if the American Hotel was utilized likewise. By the time this photograph was taken in the early 1970s, the building's tower had long been removed. -Courtesy of the Architectural Heritage Center. In 1950 the building was sold to the Union Gospel Mission who operated it as their Friendly Home until 1973. It then sat largely vacant until being demolished in 1978. Undated newspaper clipping from the Multnomah County Library's collection, circa mid 1970s. The story would usually end there. Another part of old Portland, gone, without a trace. 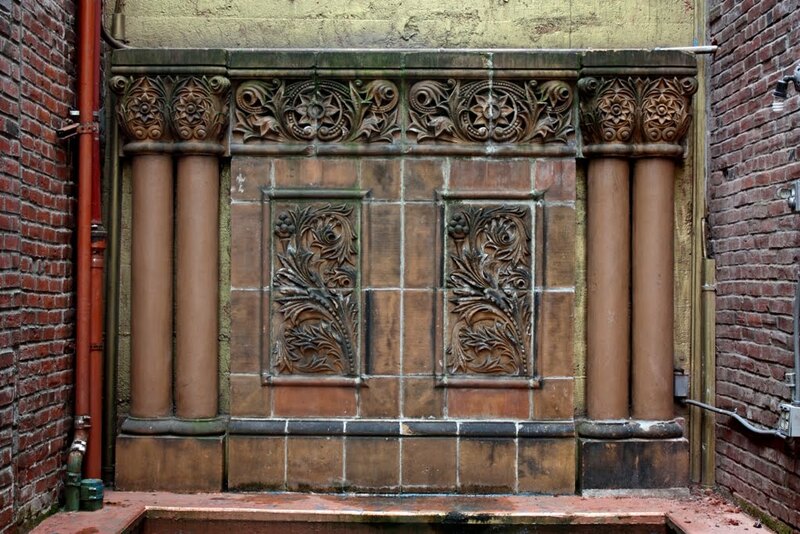 However, three decorative fixtures, including the Grand Central sandstone block survived, along with a small segment of wall that bordered the parking lot that replaced the building. 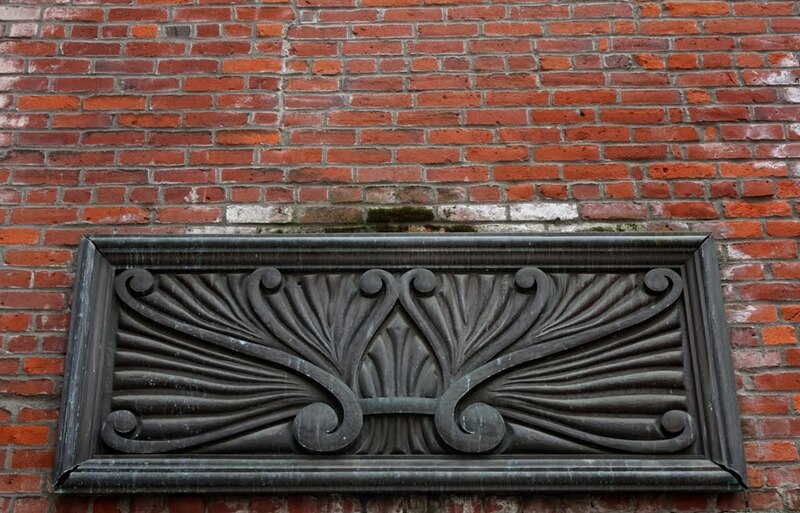 The pieces were acquired by the Portland Friends of Cast-Iron group, who were repatriating cast-iron remnants throughout the Skidmore Oldtown and Yamhill Historic Districts. They came to the attention of Bill Naito who was pursuing his vision of a revitalized Old town that built upon the areas history. 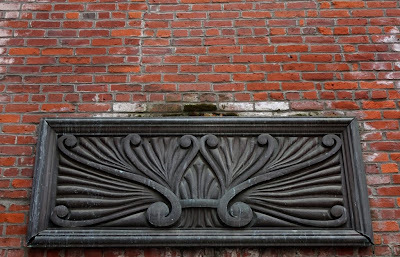 Bill Naito obtained the three fragments for use as decorative elements in the neighborhood. The Grand Central sandstone blocks he placed on the lot of his Import Plaza store, at the north east corner of First and Couch. It is not known if Bill Naito's interest in the pieces was just for their age, or if he knew of the old hotel's association with Portland's Japantown. A comparison of the Grand Central blocks with his sign on the Import Plaza building suggests that it might have had some extra meaning for him. The other two pieces from the New Grand Central were placed in a nearby alley of Couch, between First and Second, where they can be accessed through Floyd's Coffee Shop. The remaining wall segment of the old hotel was finally demolished in the late 1990s for the construction of the Classical Chinese (now Lan Su) Garden. (Part 2 of Relics, found and otherwise to follow). pointing out the sandstone blocks to me, and Bill Hawkins for telling me how they got there. First the bad news. The theme of this article is relics that are hidden in plain sight (and some, surprisingly absent). Sadly the New Grand Central sandstone blocks were not hidden enough. During the time spent researching this post it was vandalized - pushed over, and now is in three, instead of two pieces. The damage is largely to hits patina, nothing another ten years of moss will not cure. The break is clean and seamless. The fact that it is face down probably protects it from further attention. It needs help and protection. 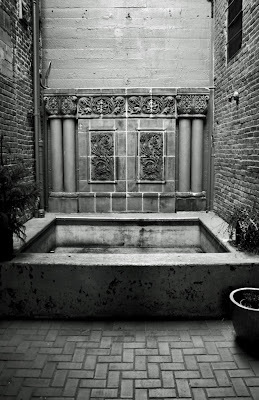 Perhaps a better spot for it is in the safely locked courtyard / alley that holds its former companions. I am happy to be a clearinghouse for information, ideas and concerns regarding efforts to restore and protect the pieces. My email address is my first initial, d followed by my last name (see profile) @comcast.net. This post was too long coming. It kept growing, both the main article and smaller related pieces. I decided the best thing to do was to break it up. Part 2 will follow but I can not guarantee it will be the next one, as other posts line up at the gate. I think a course change is in order, with smaller, more frequent posts to gain prominence. Watch this space. The good news: It looks like the David Campbell Memorial (previous post) is safe, at least from being parted out. It to has been recently vandalized (tagged) but has been repaired. 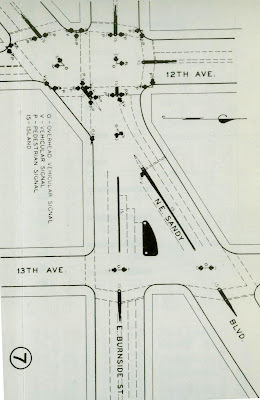 Finally, recently I showed up on KATU Channel 2 news to talk about the late "intersection from hell" at Sandy, Burnside and 12th. KATU has an article and clip here. I love this! Thanks for the research! Wasn't the Import Plaza building slated to be demolished in the past couple of years for a new fire station which didn't materialize? Either way, though, the parking lot doesn't seem a safe place for the stone sign, especially if it's just resting on the ground. May be use a few of the images in this post in our tour?